HomeMicrophone ComparisonsAT2020 vs. AT2035 | THE UPGRADE! AT2020 vs. AT2035 | THE UPGRADE! The AT2020 vs. AT2035. A comparison of two Audio Technica microphones. Grab a snack, sit back and relax because..
Reading the reviews on amazon truly left me disappointed. A good majority of the 1-star reviews that the AT2020 received were from people who had no idea what they were getting into prior to purchase. Guys, this isn’t a USB mic. It’s an XLR condenser mic that will only run off of 48v phantom power. Know what you are buying before you buy it! What is XLR? As for it’s sound, it’s extremely sensitive and boasts a flat, neutral response. It also greatly benefits from some EQ’ing. Adding a bit of EQ and compression can really make this mic sound amazing. Know that above all, it is still an entry level mic, but proves to be extremely versatile. You can record just about anything with it, and do it well! More on that a little later. Storage bag is a bit flimsy and doesn’t have any padding according to some. It really is the true definition of a multi purpose tool! 48v Phantom power via audio interface, or some sort of mixer. Behringer Xeynx 802 Mixer. If you’re just starting out, you may not want to spend an arm and a leg on an interface. 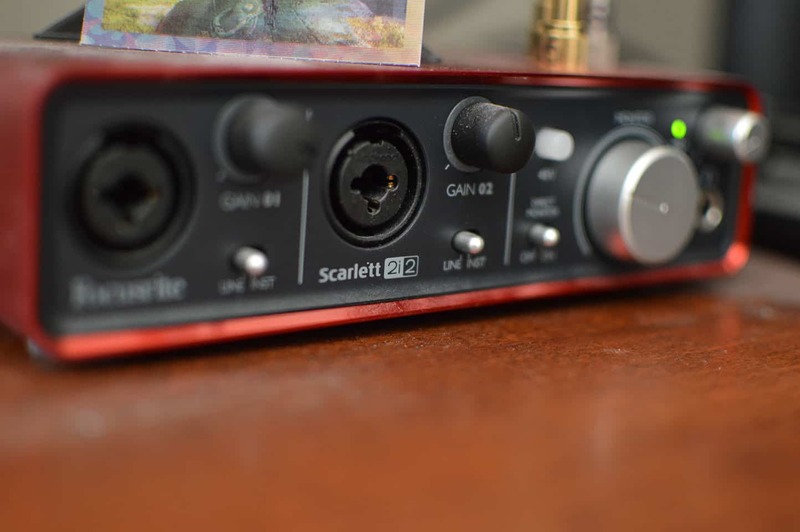 The 802 comes in handy because it has two XLR mic inputs, so you can record your vocals. It also gets really nice reviews on amazon. Pop-filter. Should be a standard purchase with most microphones. This will prevent those plosives from coming through. Plosives are just the S’s, P’s, and other consonants that sound harsh coming out of your mouth at loud volumes. The pop-filter quiets them down. It also prevents spit and other undesirables from entering the microphone and damaging the diaphragm inside. The AT2020 is a good starter investment because it comes from a reputable brand with a long line of great mics. It’s also a great workhorse mic that excels with many different applications. It’s well built and durable, and most of the complaints came from people who didn’t know USB from XLR. One negative I came across is that it may sound a tad bright, but not as much as the NT1A. Also make sure you add a bit of EQ and compression before you write it off. The raw vocals may not amaze you. This is a great all around cardioid condenser mic (What is a cardioid capsule?) and proves to be very versatile at an affordable price point. It’s a work horse and will be your go to for many different studio applications. It comes in at a nice value, boasts really impressive sound, and has a solid and heavy build. Someone in the comments section of another post asked me to recommend one, So I will: I have used the Samson PS01 in conjunction with my Samson C01 for about 8 years. A great buy! The snake arm is extremely flexible and the filter feels nice and heavy. A real durable piece of equipment!! This is really where this mic shines. It is very neutral sounding, and will not color your recording in any way, but remains crystal clear and full bodied. It is also very sensitive, which can be a good and bad thing. It will become a bad thing if you aren’t recording properly in the right environment. Check out my post on Acoustic Sound Treatment for some tips and ideas on how to get the best sound from your mic! This mic is fairly transparent, with a touch of warmth and will catch subtle nuances in your voice. Some are calling it the best Large diaphragm condenser microphone in it’s price range, and claim that it can compete with other mics out of it’s league. This mic also does well in recording guitar, drums, and piano, and even saxophone. The piano in particular is very demanding. It’s frequency range covers the entire audible spectrum, and it has a very wide dynamic range. The AT 2035’s ability to provide a balanced sound across the spectrum with ease makes it invaluable. Other reviewers have been impressed with it’s ability to handle/record pretty much anything you throw at it, and also do it well. Just be aware that it may need EQ for bass heavy instruments because of it’s warm tone. Very neutral and balanced sounding. Comes packaged with stuffs you need. Crystal clear, can handle high vocals without peaking or distortion. Comes with low cut filter and 10dB pad switches for added flexibility. Switches are a bit hard to turn on and off. Provided pop filter isn’t the greatest. The one bundled is much better. Link at the bottom! May be a bit sibilant. What does sibilant mean? Fortunately for you, the mic stand, pop filter, XLR cables, and shock-mount are all included! Look/feel/color/size. They pretty much look like identical microphones at first glance. The AT2020 doesn’t come with XLR cables or a shock-mount, while the 2035 comes with both plus a pop filter. It seems as though the 2035 has a better carrying case. The AT2020 doesn’t have any on-board switches, filters, or pads. The 2035 has the low cut filter (to reduce or eliminate low end rumbling), and 10dB pad which we discussed earlier. The AT2035 is said to have less noise/hiss. The electronics inside have been upgraded to reduce said noise. The diaphragm size of the 2035 is a bit larger than the 2020. 0.96″ compared to 0.63″. Sound pressure levels are slightly different. AT2035 has an SPL of 148dB compared to the 144dB of the 2020. This basically just means you can sing/scream/talk louder into the 2035 without distortion, as well as record louder instruments coming from a guitar amp. The 2035 is a bit heavier than the 2020. The AT2020 is slightly less sensitive, so you won’t have to worry about room noise as much. However, an investment in either mic does warrant some Acoustic Sound Treatment like we discussed earlier. The AT2035 has a bit of a smoother high end. By this point, it should be pretty clear that the AT2035 is a nice upgrade from the AT2020. If you have the wiggle room to spend more for the 2035, I say go for it. You get a little more flexibility in the form of some on-board switches, less noise, a heavier piece, higher SPL, and the added bonus of XLR cables, shock-mount, Mic Stand, and Pop filter (bundled version) for a better value. SEE THE BUNDLED AT2035 FOR YOURSELF ON AMAZON!! Well that’s about it for today my friend! I hope you’ve enjoyed this article on the AT2020 vs. AT2035..
Do you agree that the AT2035 is the clear upgrade and worth the price? I would love to hear from you. Until next time..
Audix OM5 vs. OM6 | IMPORTANT DISTINCTION! No problem so glad to help! Let me know if you ever need a hand with anything.